The Waratahs produced their best half of rugby all year to erase a 17 point half time deficit to defeat the Highlanders in Sydney. A comeback of epic proportions had the Waratahs fans in raptures and the Highlanders stunned. 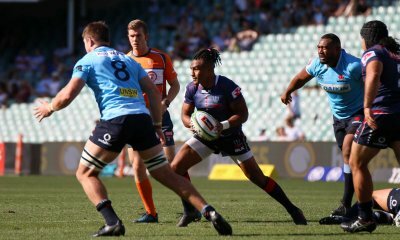 The Waratahs settled into the game well and it appeared that the disastrous start against the Brumbies a week ago was a distant memory. An early attacking raid resulted in a penalty and Foley put the home side ahead 3-nil. A quick reply from the Highlanders levelled the scores but from the ensuing kick off Michael Wells forced a penalty at the breakdown and the Waratahs regained the lead. 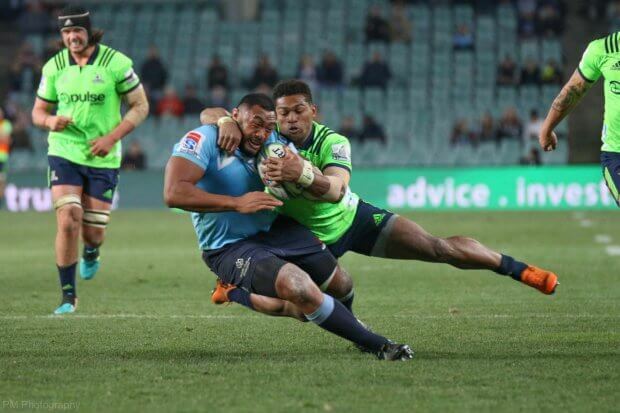 That composure only lasted 10 minutes however as the Highlanders seized on some average defence from the Waratahs backline and put Waisake Naholo into space. A valiant tackle from Nick Phipps wasn’t enough to stop Naholo dotting the ball down in the corner for the first try of the match. 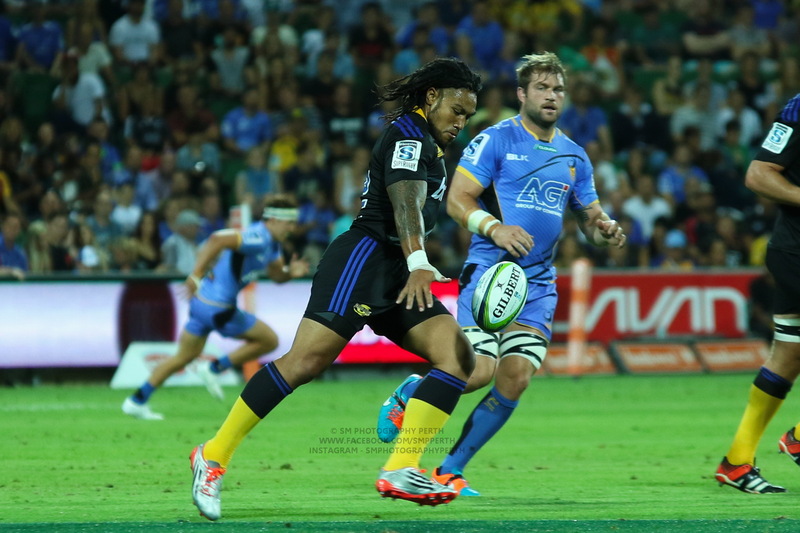 What we saw from there was the Highlanders steadily deconstructing the Waratahs defence. Against the Clan’s star studded backline the Waratahs were always going to have to be on their game defensively but instead they were disjointed and were working independently. Players rushing out of the line, overcommitting and left clutching at air were frequent events as the Highlanders produced most of their six linebreaks for the match. Israel Folau skips past Ben Smith. After another Sopoaga penalty the Highlanders extended their lead to 14 with a brilliant change of angle from Rob Thompson who fed off a well timed pass from Teihorangi Walden to scythe through the Waratahs defence and score under the posts. A further penalty to Sopoaga had extended the lead to 17 and it seemed like the Waratahs were thinking about their fancy dress outfits for Mad Monday. The only player whose mind was on the job it seemed was Nick Phipps. Perhaps that was because he’s had his fill of dressing in a cow suit this season but he didn’t give up and after poaching a loose ball he kicked into space and then forced a penalty to give the Tahs a chance to launch a comeback. Phipps was clearly fired up and looked to instill that fight in his teammates but that moment of excitement quickly deflated when the 5 metre lineout was butchered and the pressure released. The Waratahs lost Michael Wells at the half hour mark after his head collided with Luke Whitelock’s hip whilst making a tackle and was knocked out. Despite the stretcher and Medicab being called onto the field, Wells eventually got to his feet and walked off under his own steam. 23-6 at half time and most fans were considering which pub to down their sorrows at after the game. The Waratahs were hopeless and at this stage it seemed like they’d be hard pressed not to have a big score put on them in the second half. 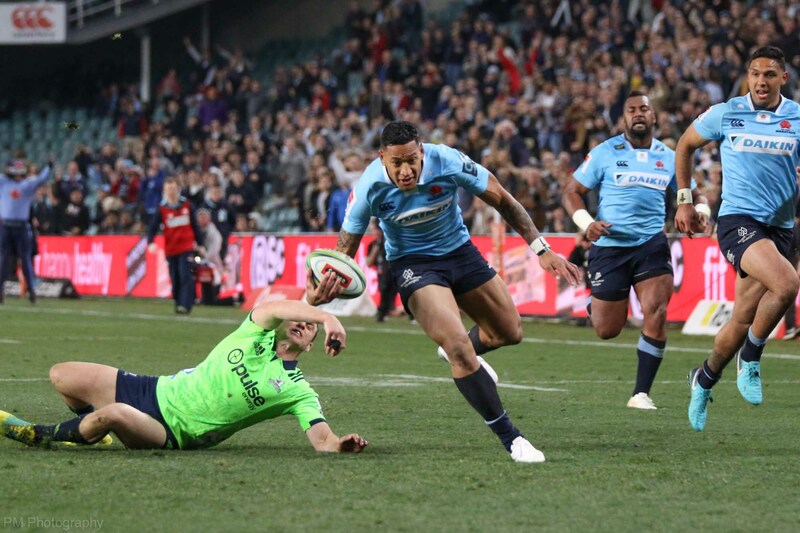 At this stage, Waratahs fans were hoping that the team could show a bit of fight in the second half and not finish the season getting flogged at home. The way the Highlanders were playing that seemed like hopeful more than likely. The Tahs got close after Foley kicked through a lose ball but Holloway was bundled into touch 5 metres out. After Sopoaga cleared, Ned Hanigan produced a boneheaded moment by bumping himl late and presenting the Highlanders a penalty from the spot the kick landed, 30 odd metres out. Another instance where the pressure was released with barely a whimper and the Highlanders again had the Waratahs under pressure. 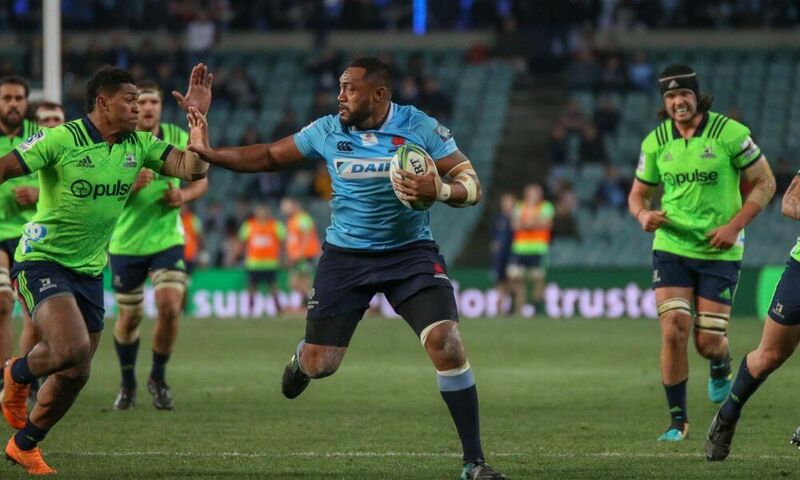 With the Waratahs defending on their own line, Taqele Naiyaravoro plucked an intercept out of the hands of Ben Smith and ran 50 metres before being dragged down. A few phases later, Kurtley Beale offloaded to put Sekope Kepu into space and the big fella pinned his ears back. A big right foot step beat the first high tackle from Naholo and the try line beckoned 25 metres away. Naholo had another crack and brought Kepu down with an arm around his neck. A second high tackle in the space of 15 metres was an impressive feat and Angus Gardner rewarded him with a yellow card for his efforts. Naholo’s high tackle of Sekope Kepu proved unbelievably costly. If there’s one thing the Tahs have shown this season it’s that they know how to score points against 14 men and thankfully, tonight they produced their best. In 10 minutes the match was turned on its head. 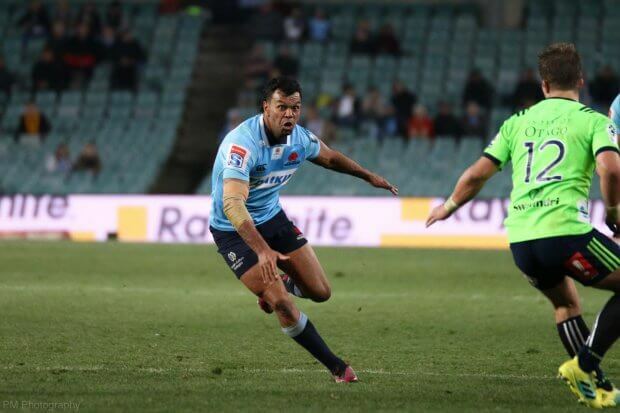 Beale started to take control of the game and a step off his right stood up the defence and then an offload in contact to Foley on his inside put the Waratahs over under the posts to commence the comeback. The Tahs had a pulse. Momentum can be a funny thing in sport and all of a sudden the Waratahs were unstoppable. A sloppy lineout from the Highlanders presented a loose ball which Nick Phipps raced towards and dived onto. A skilful regather and a quick clearance from acting half Rob Simmons had the Waratahs with front foot ball and numbers to the left. Beale again sparked the break brushing off Walden before drawing Tevita Li and putting Israel Folau over for the Waratahs second try. The heartbeat was getting stronger. Right about now, Waisake Naholo must have been getting itchy feet on the sideline. His high tackles might have given the Highlanders a short reprieve but his absence was now being sorely felt. What’s more, he still had another 4 minutes left in the naughty chair. A steady buildup saw Folau step back inside to make the break. He linked up with Phipps who then made the last pass to Foley and the Tahs were in again. 21 points in 10 minutes and all of a sudden the Waratahs had the lead. Hearts were pounding now. The Highlanders had plenty of attacking ball in the last 20 minutes and the guts shown by the Tahs defending in their red zone was incredible. Players who had fallen off tackles in the first half were making try saving tackles. Special mention must go to Alex Newsome who produced some phenomenal defensive efforts. With 10 minutes left Foley kicked another penalty and the lead was extended to 7. Could it really happen? The crowd found their voice and the chant of New South Wales, New South Wales rang out from the small but vocal crowd and it did seem to lift the team in defence. Shannon Frizell went ever so close to scoring but after Paddy Ryan grabbed the loose ball whilst both on the ground and in an offside position, it seemed like awarding the try might have been better for the Tahs. 7 minutes to go, a penalty 5 metres out and a 7 man scrum to try and hold back the Highlanders pack seemed like bad odds for the home side. Some remarkable efforts by those 7 and Kepu who had to retake the field and pack some crucial scrums. The scrum held firm and the backline defence was admirable. Again the Highlanders onslaught was repelled and hope began to build. 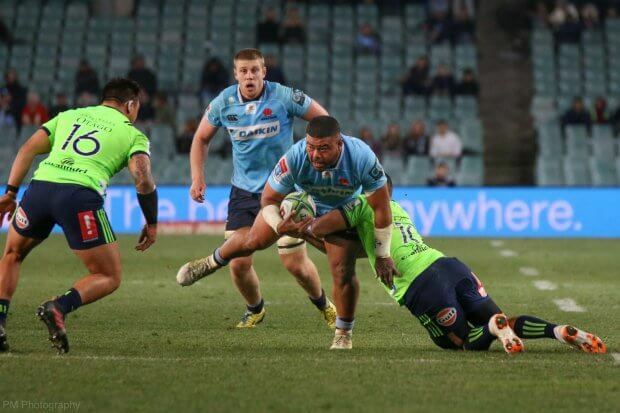 Try as they might, the men from Dunedin couldn’t find a way through the Tahs suddenly staunch defence and when the siren rung with the ball in Jake Gordon’s hands, he booted it into touch and the Waratahs was ecstatic. An unbelievable second half sore the Waratahs score 24 unanswered points and produce a memorable comeback. The Tahs would live to fight another day and they would be packing their bags and jumping on a flight to Johannesburg to face the Lions in the semi finals. Waisake Naholo might have prevented Sekope Kepu from scoring the Waratahs first try but his yellow card could hardly have been more costly for the Highlanders. 21 points in 10 minutes and the Waratahs took the lead and never lost it. Nick Phipps showed his teammates how to fight but Kurtley Beale was the one who got the attack ticking and blitzed the Highlanders. Beale by a nose. It was the Waratahs key Wallabies who won them the game. Beale, Folau, Foley and Phipps produced their best when it was needed. Hoss you called mate – Tahs by 8 !! Cannot speak highly enough of Gibson. He is THE man in my book. Coach of the season in aussie conference. This Tahs team, the forwards are a bunch of gritty, hard defending, super no names (probably all schoolboy aces) hard working blokes. I really like this Tahs team. This is how you make good Wallabies from the ground up – humility, skills, grit and no dickheads. Missed the first 30 mins as I was getting a lesson in Hungarian meditation techniques but from what I saw after only having 4 hours sleep was that Foley kicked well too. Be prepared for an upset in SA ppl. Got a feeling about these blokes. They can put 30 points on any team in 30 mins. Start shitting yourselves Lions. Your fancy haircuts wont save the day come the pointy end of the season and that day has arrived. Yep. They looked great against 14 men. Pretty average against 15 though. That could be the problem next week. is that you Ruchie ? Haha. Which part did you disagree with? I thought they looked fantastic in that 10 min period when they scored 3 tries facing 14 men. I thought they looked average in most of the other 70 min against 15 men when they couldn’t score a single try. Pretty fair observation I reckon. Got to agree re Gibson though. One of the best of the Kiwi coaches floating around, despite some of the criticism he’s had. Oh you are 100% correct mate, 100% ! HAhaha what about the Highlanders? zero tries against 14 men, zero points for the second half. Yep the Clan were terrible in the 2nd half. But what’s your point (re discussion about Tahs’ performance)? They held the opposition scoreless for a half, when their backs were against the wall. Good to see the kiwi choke is still alive and well when a team can find some pressure for them. Not even close mate. In all those examples the better won. Greg Norman used to choke. Brendan Mcallum choked. The All Blacks used to choke but haven’t for a while. The clan choked. The kiwi joke is back baby!! So… it’s sort of a compliment? Nope. It’s an observation relevant to this game. In the comments section related to this game. Unlike the long irrelevant list you provided. And if the conference system is flawed the clan shoulda won right? Choke!!! Nope. The Tahs and Highlanders finished 5th= on the log. They should have been playing in Wellington or Hamilton. Instead the flawed conference system handed them a very undeserving home quarter. Home advantage matters and that proved the difference. It’s kind of like a handicap for the little brother to give them a chance. As the 4th best NZ team and also 5th = overall on the log, the Clan also should’ve been playing away…. just not against the Tahs. Re the ‘choke’… sounds like in your book that simply means when you almost win everything all the time but not quite. I’ll happily take that. Sounds a hell of a lot better than perpetual losers with an empty trophy cabinet. Mate I might need you to spell afterdavid for me because you don’t seem to be getting it. Choking is when you had superior skill and/or control and failed to execute, usually because of a lack of confidence or discipline. The Clan did this. First you said the Tah’s only won because it was Vs 14, now it’s not fair because of the conference system. I get it. You don’t like Australia, their teams or their players. That’s fine. So just go away. We will all be happier. I honestly don’t get the mentality. I would never go to a NZ cricket site and routinely make stupid statements (apparently) with the only reason being to piss off the locals. It’s a little bit creepy. C’mon mate. Don’t we still have the Tri Nations in our cabinet?? So Archie, tell me how playing away inspired Naholo to double dip at a high tackle, while you’re thinking about what proved the difference? Why do you choose to come on this site to stir the pot? Then get pissed off when you get it back. I reckon as much as Gibson has come good, Cron is a major difference this year. yeah he seems to be really influential – good future. They seem to make a good team. I really like the vibe Gibson puts out. He seems liked and respected – not an easy thing to achieve. I like Gibson, great manner and great composure, glad we’re putting a few good minutes in at times. But I think he’s still the incomplete package unfortunately. And I hate to say that. Some of the problems we’ve had this season are due to coaching. Clearly he’s not hopeless. And he seems to have a better handle on it this year than last. With Cron on board and having had a year working together I’m hoping that next year the coaching team are a more complete package. 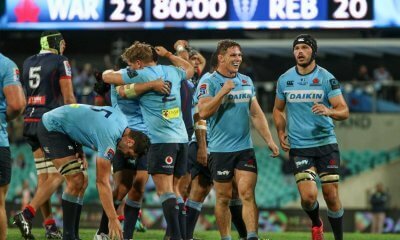 If they can finish this season with better consistency, maybe another win or two, next year could be a very rewarding and enjoyable year for Waratahs fans. agree mate – if he stays on same trajectory as coach things will be looking even better. Naholo just plain stupid. Takes one high shot and another seconds later got what he deserved and lost the Highlanders the game. Good luck to the Tahs in SA they’ll need a full 80 mins like they played in the 2nd half. The Lions will not be a pushover. Late elbow? It was dumb but he just ran into Sopoaga after he kicked it. There was no elbow and the bump wasn’t overly hard. Meanwhile Naholo made a high tackle from behind on a player 15m out from the try line with no one in front of them. A yellow card on Hanigan would have been harsh. The yellow card on Naholo was obvious. Not to mention Sopoaga had attempted to milk a penalty from Folau in the first half, much like Beale tried with Squires. Yeah it was lazy at worst from Hannigan who has racked up two impressive performances in a row. No elbow that I saw from Hanigan, but it was late and could well have been regarded as a shoulder charge. Hanigan probably couldn’t have avoided all contact with Sopoaga, but he definitely hit him with his shoulder first. Naholo’s high tackles were always YC territory, and ultimately were game changing. I agree with that read. Naholo was YC from the first high shot alone, let alone two. Hanigan on Sopoaga was dumb, and worth a penalty at most, no more. Squires and Beale was a big man/little man collision, which Foley readily accepted when explained to him by Gardner. Sopoaga lost credibility by trying to milk too much. Great comeback from the Tahs. Bloody good game actually and despite my Kiwi team losing I’m actually ok with the result. The finals have all been good games. Personally I think either of the Tahs or Canes winning next week will be a step to far but it’s a funny game this one and who knows. Well said. Congratulations to all Waratahs and Australian rugby fans. Continued poor discipline is the single biggest issue confronting NZ Rugby. Until they acknowledge it, and properly address it then they are vulnerable to not retaining the trophies most important to them. The Highlanders had their season ended last night because of it. Unless there is meaningful change they well not be the last. You ask them and they will tell you they don’t have discipline issues. That’s the issue. I tell you what, I knew they had the ability, but it wasn’t obvious at half time,…though oddly enough the first 5 min looked ok. I like this coach. He revs them up when he needs to, but apparently does so quietly, using logic. I thought, a fantastic game. Your boys looked devastated afterwards. I’ve seen it before when losing wasn’t one of the things you believed could happens. Really makes it all feel worse. Excellent write up. When the opportunities were there during the YC, Phipps, Beale, Foley and Folau all stood up to be counted. Best game I think I’ve ever seen from Phipps although he didn’t disappoint with a couple of very poor passes early in the game. I thought Beale had seen the end of the game when bulldozed by Squire, but due credit he stayed on and pulled off some crucial tackles near the end. OTH worst game I’ve seen from Aaron Smith, but not altogether out of character for this year. He is well behind TJP in the No 9 stakes right now. Well done to the Tahs. That Phipps clearance kick up Neds arse was one to show the grandkids as well. I loved the way he then tried to blame it on Neddy to. Good to them see them have a giggle about it to. Kurtley for PM! Special mention for the great effort (again) of Sekope! Great work lads. A few choice remarks from the bloke behind me at half time about what he could have spent his money on, but then… TN grabs that ball from the air (that was a Highlighters try or a Tahs yellow card for all money) and… well, Kepu doing his best TN impersonation out wide and then deliberately putting his neck in a tackling position and ding, man down and what a costly passage of play. And can we use the second half’s defence structure in the first half. Wow. From limp noodle to engorged beast, from morons to magicians from Mr Squiggle to Picasso. Ladies and gentlemen, the 2018 NSW Waratah’s. From the kick off not going 10 I said to Mrs Hoss ‘game over’. Aussie sides NEVER come back from such starts, i had seen this movie before.. The world most expensive club player kicking out on full v the Darkness in RWC 2011, on the back-foot from the get go, game over. The 2013 BIL test Sydney, dropped kickoff, Sanchez drops his bundle, game over. For 47 minutes it was the most insipid, limp and dumb rugby I had seen in a week, summed up by Phipps kicking into Flanders hammy, thank Christ he did, at that trajectory it would have been plucked by nearest Kilt Wearer and game over, BUT then Noholo does us a favour, two attempted decapitations in 15 metres and bing bam boom the kilt wearers are gone. Just on Naholo, I love the incredulous look when binned, it was almost ‘but I am a New Zealander !!’. The Tah’s Valium wore off and all of a sudden Robert was your farvers bruvva. Phipps still sprayed em like a first time visitor to India sprays a toilet, but they stuck. Foley kicks only made the usual 20m but they went out. The line out – a ‘Range Rover’ in the first half – looks ok but entirely fucked, started to purr and an 8 man scrum that got man handled in the first became a 7 man rock that wouldn’t move. Was expecting triple back somersaults of joy from you but you have to take what’s given to you by the idiot Naholo. Diehard Rebs fan but hope the Tahs go all the way and if they happen to come across the Crusaders in the final stick it to them and reserve a special forearm for one Joe Moody. The first 47 minutes, i dont ever recall myself being just so feral and disgusted at quality of play or lack thereof. Winners are grinners, but i dont know if i am elated or just plain terrified for this weekend – play like that for 47 minutes and it could be a massacre, the sort that takes a generation to get over. That was a curious quarter-final. Both teams were really good at times, and really, really bad at others. In the second half the Tahs attacked with brilliance, took the lead, and then defended with grit and good discipline. I didn’t think they had it in them; I was wrong. If the Tahs lose to the Lions, there’ll be a silver lining: the Australian Super Rugby teams will go on to enjoy a 200-day unbeaten streak against NZ teams. Anyway, for all the critics, I thought it was one of Foley’s best games ever. Beale did play well to but still skips out on his support. And Folau reinforced he really struggles passing left to right. But tackles were made, commitment displayed is spades and my MOTM was hands down Kepu for a performance of the season. And if Paddy Ryan isn’t buying everyone beers for a long time to come than he needs a… well… let’s just say he’s buying lots of bloody beers. When all is said and done, commiserations to Otago. They are a class outfit. And well done Tarts. They may not have deserved it, but what’s deserved doesn’t win matches. Something twigged, they switched on, rolled the dice and came home winners. I actually dont think Izzy is very fast at all in retrospect. If you look at the highlights when Izzy made that break, then passed to Phipps who passed for Foleys second, aroudn 60th min I think, watch the Highlanders No 6 chase him. He started his catchup run once Izzy made his break and caught him sooo easily. Izzy has distinct strengths and some average strengths. His step is defintely one but he is no rocketreddy. The only things I can add relate to the ability of the team/coach to push the “re-set” button. The scraggy form of last week continued, on the back of a game plan that looked to me like the one they tried v Lions a couple of months ago. This involved Naiyaravoro in mid field, and attempted rush tacking from too deep amongst other things. I think the rush-up by Rona and Beale that lead to the Highlanders first try was planned, but poorly executed. 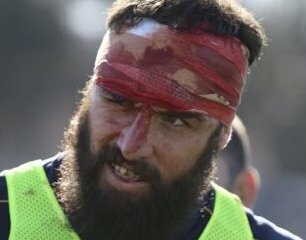 I think that Gibson deliberately didn’t use the same game plan v Highlanders as in the previous Highlanders match because they’d be ready for it. At half time the previous Highlanders game plan (flat backline with switching, mainly via Beale) was reintroduced. The kicking to Izzy wasn’t used. All of this augers well for a strategy v Lions next week that does use the flat switching backline, does use kicks to Izzy, and uses Naiyaravoro as a winger, not a chrasher-uperer. Tahs a chance again I think. Adrian I am a bit bemused by your take on the tries scored by the Tahs. Three converted tries in the space of ten minutes while Naholo was off the field. In the other 70 minutes including those after Naholo rejoined, no tries were scored. Do you really think the YC was irrelevant? I might agree if they were then able to keep that momentum going to score one or two more, but it just didn’t happen. I think, therein lies the fallacy of your observation that those tries would have been scored against almost any SR team with 15 on the field. I meant that the idea of having an extra man lifted them to perform better and move the ball, not overlaps etc caused by having and extra man. One all-round, across the park skills and consistency, everything points to the Crucaders. I think the Hurricanes are very threatening, and could easily win. They fragile like the Tahs, …but less so. At the moment I’m thinking Crusadwe’d, but could change my mind by Saturday. I’m also thinking Lions, but haven’t seen the game yet, just followed the Roar blog. If Hooper was fit I’d probably pick the Tahs right now, but he’s not. A potential concussion to Wells will make backrow issues even worse, with possibly Holloway dropping back to 8. I like him at lock, even though his hesitation possibly (and only possibility) blew a try on Saturday. I’d prefer to young flanker who came on then got subbed a minute later for Kepu’s return. I’m assuming Lions have a big pack, but I think tackling them might be better than trying to match their size. 12k for a final is a pathetic crowd. 1. 3 weeks of games in a row too much for some. 2. Effort against the Brums and at times this year so poor expected massacre. Which for for first 50. 3. Tickets bit expensive. As usual. 4. Cold night and Sydney siders are soft princesses. 5 Tahs supporters really are down to the bare bones. Need a season of razzle dazzle we’d rugby to get the crowds back. Which this hasn’t been. I reckon repay final against Saders would be luck to get 40k. After 2014 got 62k. Only just over 8000 in CHCh . Yeah but Chch has about 300k people. Sydney has more people than the whole of NZ. Naturally the expected turnout is going to be different. I think 5 is the major one, but they’re all strong factors. It’s an interesting top 4. You could argue the 2 best teams definitely made the final last year and the best team definitely won. This year the Crusdaders are the best, no question in my eyes. But I honestly couldn’t say who’s no.2. My gut tells me the chiefs but they are gone. If you asked me 6 weeks ago I would of said the Jags.. now, probably the canes on paper but they are pretty up and down. So many errors, so much stupid play but also great heart from a small pack and some really good attacking rugby (when the passes stuck). That’s the 2018 tahs in a nutshell and as frustrating as it can be to watch, it is very fun. You never know KWL you may have Ben O’Keefe reffing then all bets definitely off. Canes are my favourite NZ team and i’ll be cheering them on next Sat. Gus was just keen to get one back on a kiwi scrum half after his last conversation with TJ. Lol yeah I agree. Smith was thinking ‘WTF… a month ago I got yellow carded on this very ground against this team for doing the exact same thing? !’ Inconsistency strikes again. if the Tahs go on to win the cup i’ll be adopting Bernies new facial hair styling in their honour. Too much sport is never enough. Go the Waratahs!